$11.29 TigerChef Large Aluminum Meat Tenderizer 9-1/2"
$11.29 TigerChef Extra Large Aluminum Meat Tenderizer 10"
$4.09 TigerChef Two-Sided Aluminum Meat Tenderizer 10-1/4"
$5.29 TigerChef Two-Sided Aluminum Meat Tenderizer with Wooden Handle 10-1/4"
Create perfect steaks, chops, chicken cutlets and other specialty dishes with the Thunder Group ALMH001 Large Aluminum Meat Tenderizer 9-1/2". This piece is designed with two sides to cater to different types of meat. 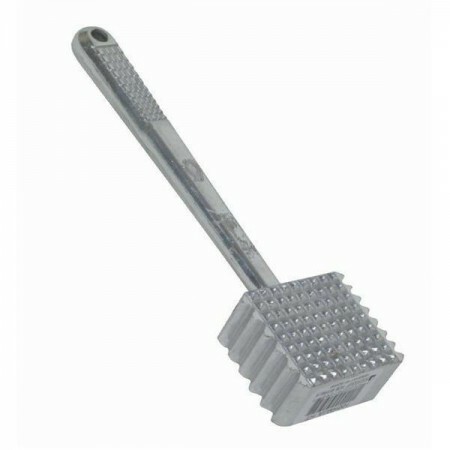 An excellent addition to any home, restaurant, or food service establishment, this meat tenderizer is made from heavy-cast aluminum which is corrosion resistant, and built to withstand the high demands of any commercial kitchen.